Meathead Movers is here to take care of the heavy lifting for you during your next move. Our Tarzana movers are clean-cut student-athletes, ready to get you safely settled into your new home. If you are looking at homes in the Los Angeles suburbs, you will need some Tarzana movers to help you relocate. Nestled at the base of the Santa Monica Mountains, Tarzana is a cozy bedroom community that is bordered by Encino, Woodland Hills, and Reseda. If you want to be away from the hustle and bustle of the city, but you still want to be close to civilization, this may be the perfect area for you. In the 1700s, the area around Tarzana was originally settled by a group of Franciscan monks as part of the San Fernando Mission. During the late 1800s, the area was home to a large number of cattle ranches, and it later became a large wheat farm. Classic film buffs may find it interesting to learn that Edgar Rice Burrows, who wrote the Tarzan series, bought a parcel of land and named it after his fictional character. Tarzana was eventually sold and subdivided into smaller parcels, and the area grew rapidly after World War II. Today, Tarzana consists mostly of single-family homes and a few apartments. Many residents, including several celebrities, make their homes in the Santa Monica foothills. It is also an ethnically diverse area that has a large number of both Jewish and Iranian-American residents. Tarzana has also been used as the location for various TV shows and movies. “The Karate Kid” and “Akeelah and the Bee” were both filmed here. There are plenty of family-friendly things to do in Tarzana, including bowling, ice skating and hiking. There are also two large golf courses. If you like to eat healthy, there are several farmers markets in the area and a Whole Foods store. 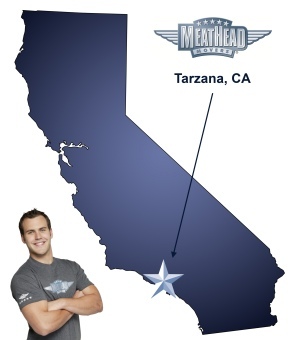 And if you’re looking for Tarzana movers who are honest and licensed, check out Meathead Movers. Our moving company specializes in local, long-distance, and commercial moves to, from, and within Tarzana. We also provide reliable packing, storage, on-site relocations, and our distinctive moving concierge service, which connects you with local service providers. When you are ready to move, Meathead Movers can assist you every step of the way. Our employees are clean-cut student-athletes who can easily handle even your biggest pieces of furniture. Our Tarzana movers stay in shape between jobs and have undergone thorough background checks. We understand how important your possessions are to you, and we want you to know that we treat your valuables with the utmost care. We invite you to experience the Meathead difference and call us for a no-obligation moving quote today. I appreciated the follow through from booking, reserving, and to the guys showing up right on time with copies of the paperwork that I had forgotten to fax back to you. They patiently listened to my partners instructions and packed the items exactly as we requested. I will absolutely use Meathead again for my next move!!! The 4 kids, were great. They worked together as a team and representatived your company extremely well. Well done Meathead’s!!! The moving crews have been very quick and efficient, nothing broken in the move! I'm sorry to share the crew of packers this past week we're not as efficient nor finished the packing in a timely manner. I had sorted items, labeled them for packing so I could easily find items once the move was completed. Our boxes were labeled by room but not by items so I've been frustrated having to hunt for items I need. After 3 hrs I could see the packers were going to not finish so I ended up going to pack stuff in the garage to lighten their load. Finally, Brooke mentioned the aerosol restrictions but did not mention the liquid container restrictions so after the packing I asked why so many boxes were untaped. It was then she mentioned they cannot transport open liquid containers. Truthfully, I would have boxed up the shampoos, oils, etc in boxes myself to avoid so many open boxes. I think this crew could do better by working more quickly, like our packing crew in August had. TAylor and his crew of 'studs' moved so quickly and efficiently to load our stuff for our move. The crew was so pleasant they actually made a stressful and emotional day so much more pleasant. At the end of the evening, the crew still had great attitudes and were accommodating as we changed locations of furniture a couple times. Thank you TAylor, Charles C, Jordan P, Alan M, Anson A, Armando J, and Juan V! Anthony & Luis were fast, very friendly/helpful! The packers and movers were so nice and efficient! They were pleasant, worked hard with little to no break until lunch! Items were carefully packed and neatly organized, labeled, and arranged for our movers. Thank you!